Jamil Fakhri was born in Lahore in 1946, on completion of graduation he joined the National Bank of Pakistan. He entered into theater at WAPDA Auditorium and Alhamra Lahore with Kamal Ahmed Rizvi, Athar Shah Khan, Ali Ejaz and Nanha. His famous stage plays includes Andar Ana Mana Hai, Zuban Daraz and Lahore Bypass. He was considered among the founding artists of Ptv Lahore, TV producer Yawar Hayat introduced him on Ttv. His popular plays on TV are Tanay Banay, Daldal, Waris, Andhera Ujhala, Bandhan, Ek Mohabbat Sau Afsanay. His role of police inspector Jaffar Husain in Ptv’s play Andhera Ujala became so popular that film director Shabab Keranvi chosed him for big screen. Fakhri acted in more than 50 films in which Muskarahat and Deewany Do, Ye Zamana Aur Hai are the among his best flicks. His last play Dil Day Boohay was telecasted on Ptv on May 22, 2011. On May 31, the day he suffered a stroke, his play Sehra Teri Pyas went on air at a private channel. 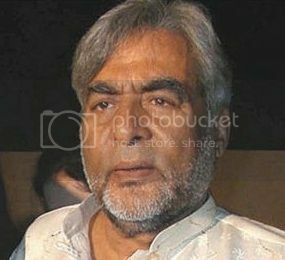 Renowned film and TV actor Jamil Fakhri passed away on 9 June 2011, he was 65 years old. He was admitted into the Mayo Hospital on May 31, and placed on ventilator for a few days. He also suffered a stroke which resulted in paralysis. Factually the death his young son Ali Ayaz Fakhri in USA a few months back took a heavy toll on his health. His namaz e Janaza was held at Qila Luxman Singh and buried at Ilam Din Shaheed compound Miani Sahib Graveyard Lahore.